You may or may not have heard the term NDT fuel tank testing before. But what you should know is that it’s completely invaluable in protecting your storage tanks, pipework, vessels and other safety-critical components. An increase in Fatty Acid Methyl Esters (FAME) in fuels has led to accelerated tank and pipework corrosion. This coupled with bad weather and poor operating conditions can cause leaks or tank failure that will damage not just your pocket but the environment too. This highlights the importance of regular interior inspections to test for signs of cracks, defects flaws and corrosion which can compromise its integrity. While regular external testing is beneficial, it can only detect whether there’s a current leak, which is often too late to rectify. Non-destructive testing (NDT) is a term widely used to describe a range of techniques used to inspect, test and evaluate critical safety components to identify a breach in integrity. NDT fuel tank testing is the only method that can see the exact ‘health’ of a fuel tank and associated pipework, whilst causing no disruption or damage whatsoever. 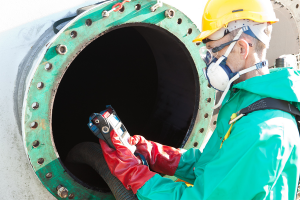 Using measurement techniques, NDT can identify emerging corrosion issues before a leak actually occurs, to prevent significant environmental and costly problems. Health and Safety Executive (HSE) recommends that NDT should be conducted every 12-18 months. Failure to protect your fuel tank and its pipework could also jeopardise insurance policies, making regular testing a long-term investment rather than a short-term expenditure. 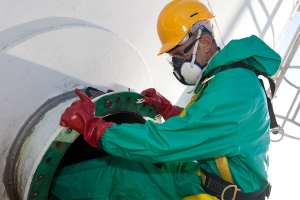 Many businesses have implemented regular NDT testing and fuel tank inspection programmes to ensure the life expectancy of their fuel storage facilities. Call our friendly team today on 0845 313 0845 to find out more about NDT. Our engineers use an ultrasound probe to take multiple readings to gain an understanding of the thickness of the skin of the tank. This will show where the skin has thinned from corrosion and pinpoint where a leak is likely to occur. Following testing, you will receive a detailed report which will satisfy asset management procedures, insurance and compliance inspection by regulatory authorities. It will of course, inform you of any next steps needed to be taken to protect your operations. To find out more about our non-destructive fuel tank testing services, get in touch with our friendly and knowledgeable team by calling us on 0845 313 0845 today.